Mick Brady grew up in Chicago, and spent part of every summer in Wisconsin, so she's a city girl with a strong country streak. She and her eight brothers and sisters were equally at home on the sidewalks and in the woods. Brady earned a BA in political science and an MA in social science from the University of Illinois. She later moved to Asheville, North Carolina, where she earned a BA in drama from UNCA. She taught writing and critical thinking at her alma mater for several years before setting out for California. Brady earned an MFA in screenwriting from the University of Southern California, and she taught writing and critical thinking courses at Pepperdine University in Malibu. Both at UNCA and at Pepperdine, she focused some of her critical thinking courses on UFOs and alien abductions, popular mythology, and paranormal subjects. Brady has worked as an editor in the tech industry for almost 20 years, and she currently serves as managing editor of ECT News Network. She lives in Ventura, California, where she is fortunate to have access to hiking trails in the mountains and bicycle trails along the beach. In addition to writing and promoting her creative work, she fills her free time with gardening, reading, watching movies and TV, and hanging out with family and friends, both virtually and in the real world. Mick Brady has a captivating style of writing, drawing readers into the minds of the characters and taking them off to exciting places. The exotic character of the writing is augmented by the author’s ability to evoke powerful images; it is at times poetic, at times descriptive, but it creates an atmosphere that reflects the moods and the themes beautifully developed in the writing. The opening is powerful, lyrical in style and filled with symbolism. Listen to these lines: “Louis Armstrong's trumpet painted the walls of the little craft with soaring blue notes. He climbed, she fell. The contrast pleased her. Will sat back, muscles relaxed, mind drifting in a pleasant state of meditation.” And that is how the entire novel reads; a work of pure imagination and excellent craft. The characters are phenomenal, ingeniously developed and relatable. 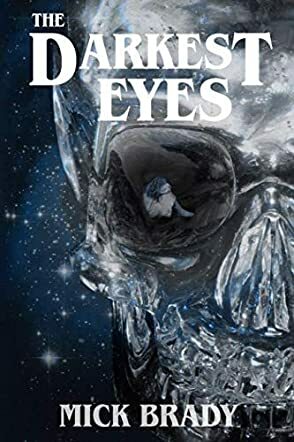 The Darkest Eyes has an unusual plot, written to excite the reader’s imagination. There is balance, entertainment, and eerie music that readers hear in their minds as they read this engrossing narrative.